One lesson of which advisors are reminded regularly is that when investors retire, the only aspect of their life that changes is their work schedule. New retirees simply are not done living just because they retire. They are not done earning money, they are not done spending money and they are not done investing money. They are also not done learning about how to invest money and make the most of their portfolio in retirement. Spectrem’s new study on financial literacy and education – Educating Millionaires: Filling in the Blanks - shows that retired investors are invested in their own education and knowledge as it relates to their investments. Two areas discussed in the Spectrem study relate directly to retired investors, namely what do they feel they still need to be educated on, and how do they want to go about being educated? Financial literacy is a controversial subject in American education circles. It is considered one of the areas in which recent school district curricula are disappointing, as many students get through high school without ever taking a course in basic economics or financial literacy. However, among retirees surveyed for the Spectrem study, only 34 percent said they had ever taken a financial literacy course, either in high school, college or in some form of continuing education. That is a lower percentage compared to the 40 percent of working investors who have had some form of financial literacy education, which is still a very low percentage. Just because retired investors do not have any formal financial literacy training or education does not mean they feel they are uneducated about economics or investing. According to Spectrem’s constantly updated data base, 23 percent of retired investors consider themselves to be either not very knowledgeable or not at all knowledgeable about investor products and services. Retirees are, on average, older than most investors, and as such have a different routine for finding out information they need. 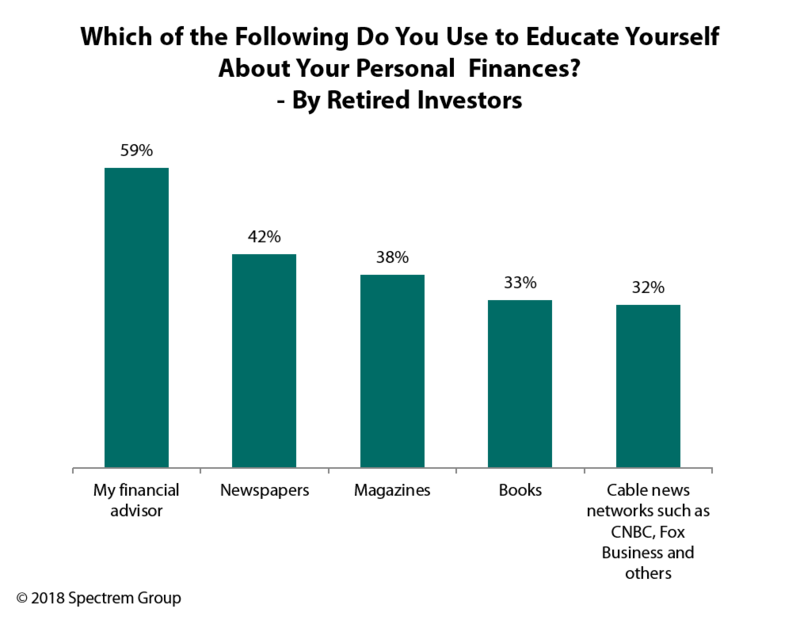 Asked how they would choose to educate themselves in personal financial matters, 59 percent of retirees said they would contact their financial advisor, but 42 percent said they would read newspapers and 38 percent said they would read financial magazines. Notably, 32 percent said they would get the information they needed from cable news networks such as CNBC or Fox Business. It’s nice to know investors take it upon themselves to get educated on matters related to their personal finances, but retirees are more likely than other investors to look to their financial advisor for such information. Asked on a 0 to 100 scale “who do you feel is most responsible for providing information and knowledge regarding your financial choices’’ retirees averaged a response of 39.40, which leans towards holding themselves responsible, but is more advisor-leaning than responses from working investors (28.20). Retired investors are probably not as active in terms of key portfolio changes as working investors, but retired investors have more time to consider their investments and are more directly related to the results due to changing financial needs. Advisors should consider the educational needs of retirees when developing materials for financial literacy, and should ask retired investors where they feel they are deficient in knowledge they need to make wise investment decisions.